It's not the greatest pic, but I think you get the idea. :) As far as stitching I have been fleeting from one thing to the next. Trying to settle on something. I stitched a little bit more on my Stacy Nash pillow..
Well, my dad just called and he's on his way! Write later (hopefully with some stitching progress to share)! Beautiful furniture and living room...your starts look great too...and love that Good Huswife design. Have fun with your dad and wife! What a lovely room, Nicole. I love all the windows! You have some sweet projects there. I know what you mean, sometimes even when you have all these things to stitch you just can't settle on one that you are really excitied about. It'll come. Have a good weekend. I love your living room and the furniture is gorgeous! Love the lamps and pillows as well. Great projects for being in a slump :) Your new furniture looks great! Your living room looks so inviting. The leather couch looks comfy, the room looks tidy, and everything's ready for when your father arrives. I know what it's like when you're trying to get things in order for when guests visit. I love your living room, it looks fabulous ! Your living room is very beautiful - love your new furniture! 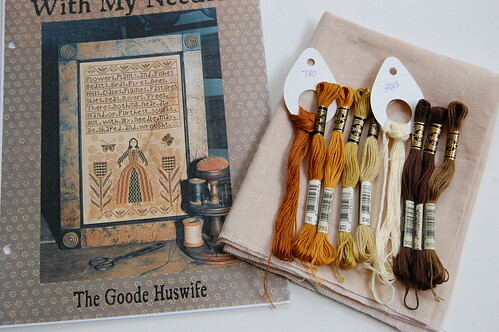 Great new stitching starts - especially the Goode Huswife piece. Love the living room, Nicole! It looks very cozy--and what a wonderful wall of windows! 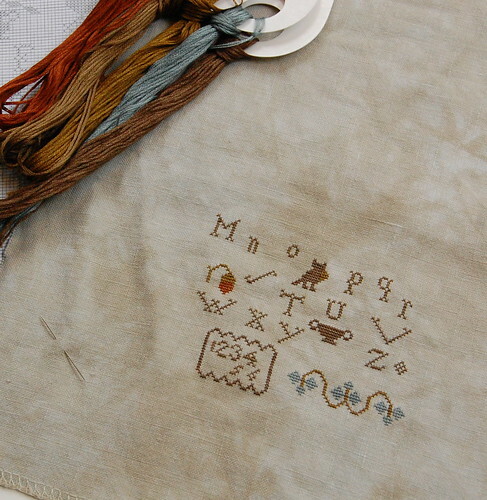 Great stitching projects, too. Good luck with the slump. I HATE feeling so restless about my stitching but maybe once you get stuck into a project, you'll be okay & feel a bit more settled. Enjoy your dad's visit! I have to comment on your blog. I really like it. 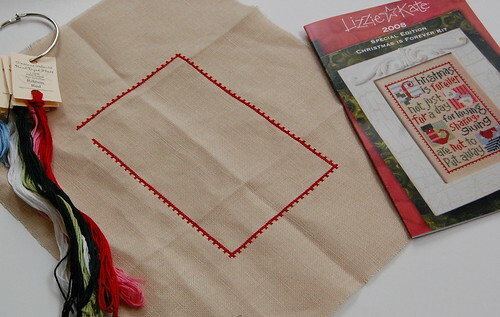 You have really got nice pictures of your cross stitching projects. It just makes me wanna cross stitch all day long when I look at them. I love your livingroom. 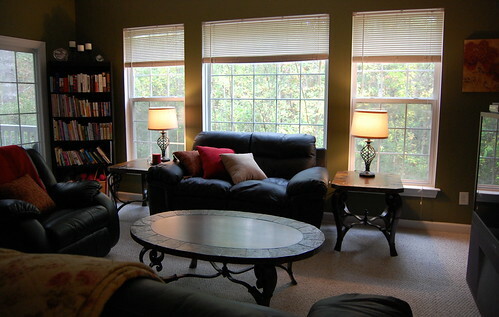 I have black leather furniture as well, and it is very practical! Your living room looks marvelous! It's nice to have big windows isn't it? We're long over due for a living room makeover. Figured out where to put your stitching nest yet? Maybe that's why you're in a slight slump, LOL! Your living room looks so comfy and inviting. Good idea to go with dark leather sofa's too. We've got chocolate brown leather ones. Easy to keep clean with the kids. Your living room looks soooo comfy, cozy and pretty! Looks like you have some great projects on the go. Love your new furniture! You've made the room look fantastic! Your stitching slump will fade before long! Enjoy your dad! You have some wonderful large windows. Your new room decor looks fabulous. Have an enjoyable time with your dad and wife. Your living room looks lovely - I've just moved myself, and have bought some new living room furniture. I haven't had the chance to take pictures of it as yet, though. Congrats on the new furniture! Love your SN piece and that Goode Huswife piece will be gorgeous!